Your home bar isn’t fully stocked for the holiday season until it features one of these DIY bar stools. 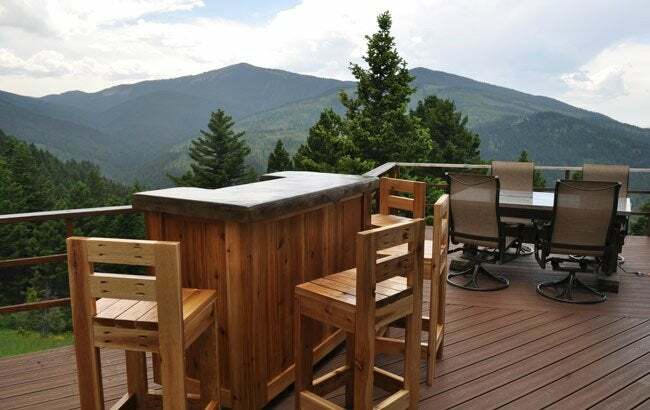 Whether located indoors in the kitchen or outdoors on the patio, a home bar can be a scene of rest, relaxation, and revelry during your potlucks and cocktail parties. But if there are more drinks to go around than there are seats, your guests will spend most of the party playing a game of musical chairs. To prevent a lack of seating from hampering your hosting duties, we’ve handpicked five DIY bar stools that would elevate the ambiance of your bar—and have every guest flocking to it. 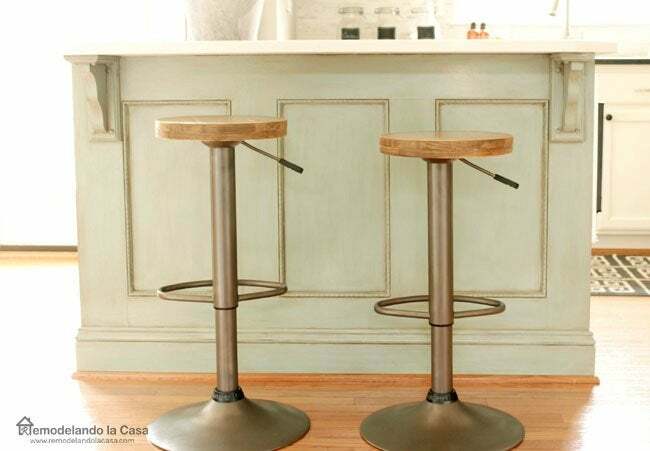 This industrious, adjustable-height stool from Ana White will feel right at home in an industrial-style kitchen or bar. 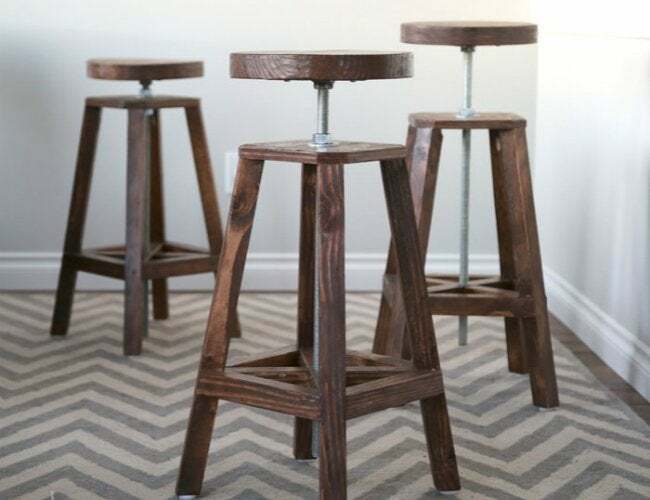 Like the DIY maven, you can achieve this look by cutting and assembling rectangular scrap wood planks for the legs and cross beams, a square with angular-cut corners for the seat, and a round for the booster seat. Drill an all-thread rod from the booster seat to the cross beams to construct the adjustable-height mechanism and ensure that no order is too tall for your home bar. 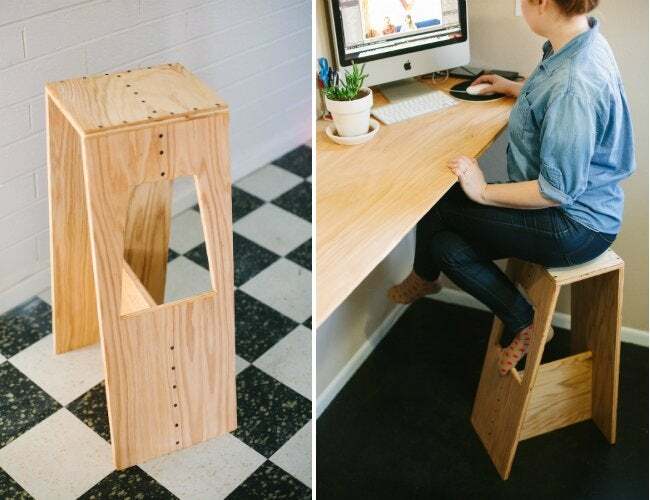 When creating an ultra-flexible work environment for his wife, the handy husband at Subtle Takeover devised this modern, elevated stool from rustic plywood to accompany her standing desk. Cut from plywood into three pre-drilled planks for the seat, front leg, and back leg, the stool can easily be glued and screwed together. A coat of polyurethane over the finished furniture heightens its style in the refurbished workspace—though this workhorse of a stool easily transitions from the office to the bar. Nothing is better than pulling up a seat at the outdoor patio bar with this rustic all-wood stool from DIY Pete. Start by cutting your cedar lumber supply into lengths for the legs, seat, support beams, and seat back. Pete’s detailed guide to cuts at seven different lengths and exact spots for holes will walk you through each step of the weekend woodworking project. Once you finish attaching the seat boards to the support, test them out while you call up friends and family to invite them over. This industrial pipe stool from Love Grows Wild is the best seat at the bar—bar none. Give the idea some legs—specifically, four legs—by assembling together pipe, pipe fitting, 90-degree elbows, and caps. 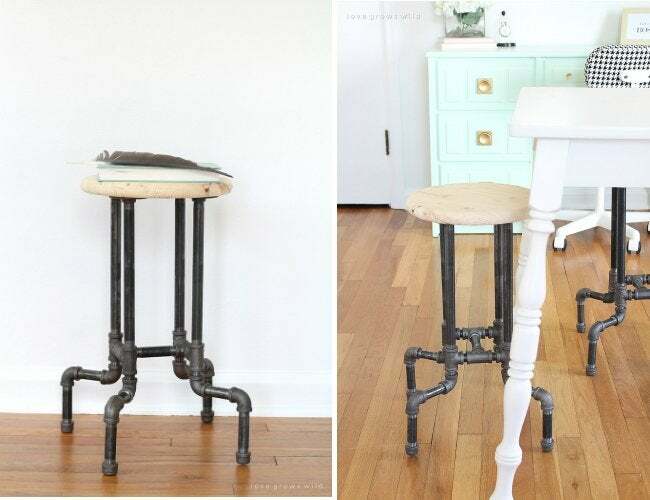 After adding a floor flange to the top of each leg, secure the round, wooden seat to the top of the stool. Let the seat go au naturel, or stain or paint it to make a splash long before drinks are served. The blogger at Remodelando la Casa wasn’t always sitting pretty in these inviting, industrial-style stools. After observing the clash between her modern bar stools and rustic kitchen, she settled on a hybrid of the two styles. To mimic the DIYer, create the wood round from pine, poplar, and plywood boards, all glued and cut to size for a comfortable seat. Then simply spray-painted metallic base of an existing stool to marry the old world with the new, and finish off with the addition of the new tops.